Interlibrary loan (ILL) is a popular research support service in Colorado libraries. ILL borrowing has increased substantially among public and academic libraries in the state since 2004. Although the increase has been steady for these libraries, items borrowed via ILL still make up a fairly small percentage of circulation overall. ILL traffic has increased considerably among Colorado’s academic libraries between 2004 and 2008. During that time, the number of items borrowed via ILL has increased 68 percent (see Chart 1). Like academic libraries, the number of items borrowed via ILL has increased significantly in the state’s public libraries—69 percent between 2004 and 2008. How does ILL affect circulation overall? 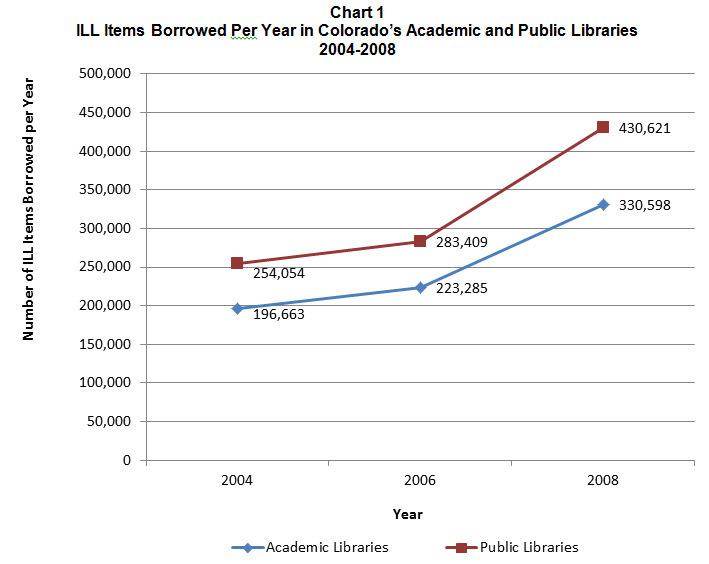 Clearly, borrowing through ILL among both library types is increasing, but is that increase impacting circulation? For public libraries, items borrowed through ILL make up a relatively small percentage of total circulation – just under 1 percent (see Table 1). In academic libraries the percentage is higher, increasing from 5.5 percent in 2004 to almost 11 percent in 2008. Circulation is changing differently among the two library types as well. In public libraries circulation has increased 24 percent, while in academic libraries it has decreased 14 percent. Although borrowed ILL items constitute a higher percentage of circulation in academic libraries, this is due, in part, to the fact that circulation overall has declined over the past five years. The increased use of ILL combined with the decrease in circulation in academic libraries could also represent a difference in how public library patrons and academic library patrons use their libraries. Though ILL borrowing is a relatively small percentage of circulation, ILL is still an important service providing patrons with otherwise unavailable resources. Prospector, the unified catalog of 25 academic and public libraries in Colorado and Wyoming, is one way Coloradan’s are receiving these resources. Rose Nelson, Systems Librarian for the Colorado Alliance of Research Libraries, said 65 percent of Prospector libraries’ holdings are unique items. By collaborating with other libraries through programs like Prospector, Colorado’s library patrons have access to those unique, otherwise unavailable, items. In addition to public and academic libraries, borrowed items increased, though not as dramatically, among a school library cohort of about 320 libraries. This cohort of 320 libraries are libraries that consistently submitted the Colorado School Library Survey in 2004, 2006, and 2008. Items borrowed per week through ILL increased 11 percent for these school libraries between 2004 and 2008. All of Colorado’s school libraries are not discussed here because not all school libraries participate in the annual survey. The unique combination of these services creates a climate that greatly supports ILL use in Colorado. Although generally a small percentage of circulation, ILL service is an important service that enables libraries to meet their patrons’ unique information needs.